Prior to the arrival of Europeans, the area that has since become the state of Minnesota was populated by a variety of Native American peoples including the Anishinaabe and the Sioux. French fur traders, who reached the area in the 17th century, were the first Europeans to arrive. Later in the century, they were followed by Ojibwe Indians who migrated Westward into the area. The lands that were later to form the state of Minnesota was acquired by the United States in a two step process: the lands East of the Mississippi River were acquired by the 1783 Treaty of Paris at the end of the American Revolution (1775 to 1783), whereas the lands to the West of the Mississippi were purchased from France as part of the 1803 Louisiana Purchase. The first American settlement of the region began in 1805, when Zebulon Pike acquired land in the area. 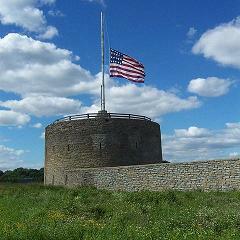 This was followed by the construction of Fort Snelling, which took place between 1819 and 1825. The Minnesota Territory was formed on March 3rd 1849 by combining parts of the Iowa and Wisconsin Territories. The state of Minnesota, consisting of the eastern portion of the Minnesota Territory, was admitted as the 32nd state of the Union on May 11th 1858. Treaties made between white settlers, and the Sioux and Ojibwe, gradually forced the Native Americans off their lands and into smaller and smaller reservations. The deteriorating conditions suffered by the Native Americans, eventually culiminated in the Sioux Uprising of 1862. The Sioux were defeated after a war lasting just 6 weeks, and, following the war, 38 Indians were executed in a mass execution and most of the rest set into exile in Nebraska. Minnesota's economy was initially centered around logging and farming. However in the late 19th and early 20th centuries, industries began to emerge principally flour milling and iron-mining. Following World War II, farming was mechanized, and a number of new high technology industries began to emerge in the state.